This is a hollow based projectile point from the Fayum A Neolithic in Northern Egypt. Whether these arrowheads were attached to wooden shafts or used in spears is difficult to confirm, but representations of men drawing bows can be seen on jars from the early Predynastic Period (ca. 3,6 k.a. BC). The earliest hollow based points appear in the Bashendi A layers at Dakhleh (5,7-5,3 k.a. BC; McDonald 1999). They are also present at Merimde at the same time they appear in the Fayum Neolithic A (5, 2-4 k.a. BC). They continue until Badarian and Naqada I times (4-3,5 k.a. BC). They are often called ‘Fayum Points’ but also occur in Upper Egypt, for example at Badari. It is unclear if they continue until Naqada II times (3,5-3,1 k.a. BC). Over all Neolithic types tend to be more finely made than the Predynastic types. Sites of the Fayum A Neolithic are about 5,2-4,0 k.a. BC are mostly represent camps located at an ancient lakeshore. At Kom W, which is the largest known settlement so far, almost no remains of buildings were found but about 248 "fire-holes", which the excavators interpreted as hearths. Many grain silos were found. There are many animals bone - including domestic animals - attested, but it is not clear whether they were already fully domesticated. Hunting large and dangerous animals and fishing were very important. Stone artifacts of the Fayum Neolithic are based on two main technologies: the production of flakes from simple cores with some of the flakes subsequently being shaped into tools, and the manufacture of tools by bifacial flaking. During earlier surveys there was certainly a bias towards an exaggerated number of bifacial tools, anyhow their presence remain to be explained. 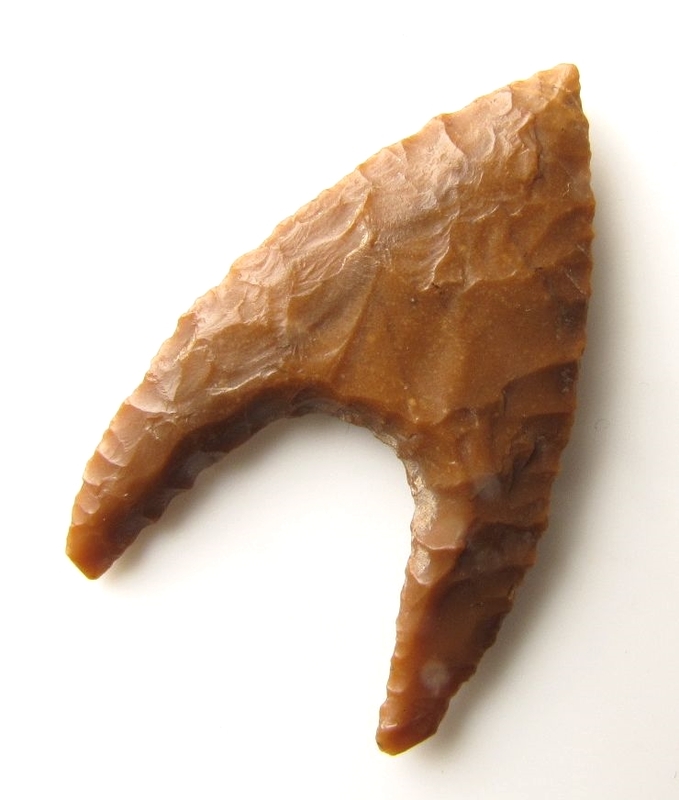 The main classes of bifacial implements are polished and flaked axes, knifes and symmetrical leaf-shaped artifacts, bifacial sickle blades, and an enormous diversity of concave often hollow-based projectile points. The projectile points have been found among the bones of a hippopotamus and an alleged elephant respectively (Caton- Thompson and Gardner 1934). These findings clearly indicate at what kinds of target animals such projectiles were shot. Experimental work has demonstrated that bifacially-retouched thin projectile points penetrated more deeply into animal bodies than informal flake points did, and are less likely to bounce off a target animal especially if hafted onto shafts (Odell and Cowan 1986). It is therefore probable that compared with microlithic or flake equivalents, large bifacial projectile points proved their better killing power and higher reliability when they were used for hippopotamus and crocodile, and thus were selected for. The purpose of the long, wing-like tangs of this hollow type of projectile points has been questioned, as they are likely to snap off after impact. This means that they are likely a single use item, but it also has implications for hunting and warfare. The shattered ends could embed in the flesh, enhancing the damage to the target. Bifacial projectile points are objects, worked on both sides that must be roughly symmetrical. This creates a special challenge for this shape, as the delicate tangs must remain in the same plane and have the same length and width, as the deep central hollow is created. The body of the arrowhead is covered with minute retouches where the flint has been carefully taken off by pressure flaking. The creation of such an implement represents a time-consuming choice, rather than a necessity. The shape certainly reflects a culturally important message. Thus, it may be possible to argue that functional benefits (impact fracture) were entwined with prestige factors (time and material quality) and perhaps aesthetic qualities.